My research uses big, open data and statistical and theoretical models to understand how communities of living things function and how humans' activities affect them. As an ecologist, I aim to test ecological theory about how the physical environment and interactions among organisms combine to create the biodiversity patterns we see on the landscape. As an environmental scientist, I am using data and models from ecology and economics to quantify the environmental impact of food loss and waste in the United States and determine what policies we should implement to reduce food waste and mitigate the overall burden of the food system on the environment. My research is driven by big questions in environmental science and ecology. Click on one to learn more. What is the environmental impact of food waste, and how can we reduce it? What drives biodiversity across scales? How is energy distributed in natural systems? Can we predict communities of species from their traits? How does global change affect living communities along natural gradients? Environmental footprint of food waste. Food waste is the signature problem of our culture of abundance. To maintain human life, it is necessary to consume land, water, soil, and energy resources and to place some burden on ecosystems around the globe. Constructing an inefficient food system that throws out 30% to 50% of the food we produce every day — that is a trademark of our culture of abundance, profligacy, and waste. Globally, six garbage trucks full of edible food are wasted every second, roughly corresponding to the weight of 10000 aircraft carriers annually — or 2700 Empire State Buildings — or 150 Great Pyramids of Giza. For another visceral comparison, the average American citizen is responsible for roughly his or her own weight in food waste each year. My blog has more in-depth thoughts on food waste. I am working on the food waste problem as part of a research team based at SESYNC in Annapolis, Maryland, USA and led by Mary K. Muth, head of nutrition and policy research at RTI International. First, we aim to gather as much data as we can on food waste in the United States. Next, we are modifying an environmentally-extended input-output model developed by the U.S. EPA to calculate its environmental footprint. The footprint includes the land, water, energy, and chemicals that are contained in wasted food and the pollution and loss of biodiversity it causes. Finally, we are evaluating a number of recently proposed food waste reduction solutions to see which ones are the cheapest to implement and the most effective at reducing the burden of the food system on the environment. Our preliminary findings show that interventions aimed at preventing food waste before it occurs are far more cost-effective at reducing the environmental burden of food waste than efforts to repurpose or divert already existing waste. Eventually, we plan to model spatial variation in food waste across the supply chain and among regions of the United States to find sectors of the economy and geographical regions where incentives do exist to reduce food waste, and to determine how we can get producers, processors, and consumers to act in their own best interest by preventing food waste. Using remote sensing to link biodiversity and geodiversity. In collaboration with researchers from NASA and other academic institutions, I am exploring the relationship between biodiversity and geodiversity (variation in the physical environment) from small to large spatial scales. We are connecting biodiversity datasets with huge scope in space and time, including the Forest Inventory and Analysis dataset and the Breeding Bird Survey dataset, with remote sensing data from NASA including elevation, climate, geology, and human land use. Combining data with disparate spatial scales requires special techniques of analysis; through this project, we are advancing the cutting edge of spatial statistics. Read more about this work here. 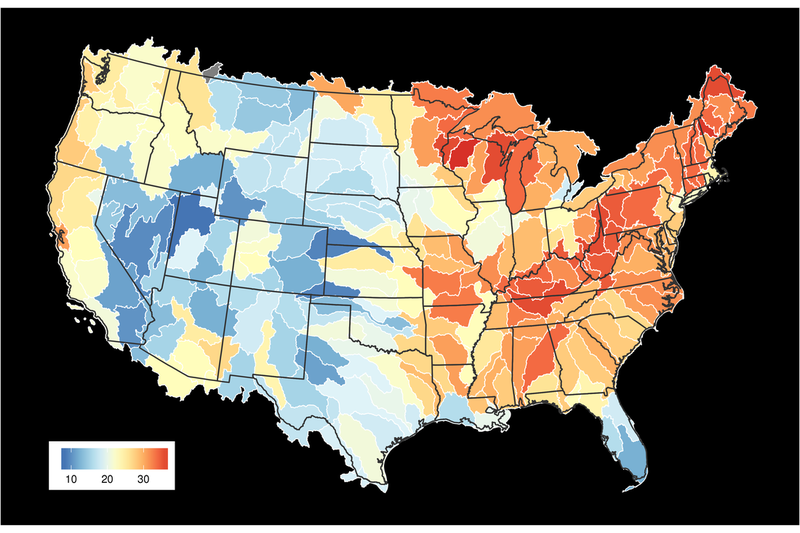 Land and water biodiversity at nested watershed scales. Biodiversity research in land-based ecosystems and freshwater ecosystems has largely been two separate efforts. With a team of interdisciplinary researchers, we are exploring the mechanisms relating land and freshwater biodiversity. In this project, we are looking at biodiversity at the watershed level. Since watersheds are naturally nested, this lends itself to multiscale comparisons: we hypothesize that the strength of linkages between land and water biodiversity will depend on watershed scale. 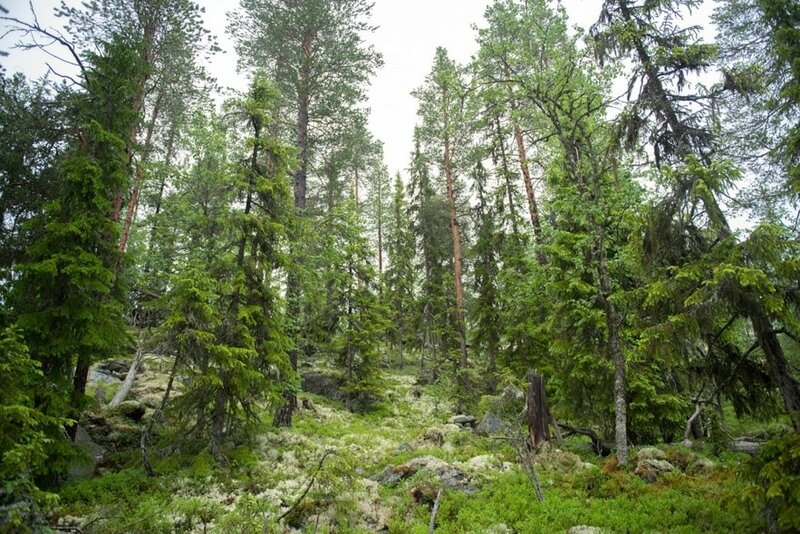 ​Climate and competition effects on northern forests.​In collaboration with researchers from the University of Copenhagen and the Norwegian Forest and Landscape Institute, I am analyzing a forest survey dataset that spans the entire country of Norway since the 1980's. I am fitting Bayesian growth models incorporating functional traits, climate, and competition to these data, and building a mathematical model to make country-scale predictions about future forest growth. Following from the observation that species diversity varies across space, especially as you go toward the equator, ecologists think that species' niches may determine how many, and what kind, of species can coexist in a local community. I am working on several projects testing niche theory with big species datasets. Rodent niches across the continent. We are using a dataset of rodent communities and traits collected at the National Ecological Observatory Network (NEON) sites to develop a novel method to measure niche overlap among co-occurring species and ask whether overlap patterns differ along environmental gradients. Read more about this study here. ​Bird niches across the globe. Using a dataset of bird specimens and their body masses collected around the globe, we explored the idea that species closer to the equator have different constraints on their niche breadth than species in the temperate zone. Read more about this study here. How is energy distributed in living systems, and how have those patterns changed over time? The answer to that question has consequences for how we understand the relationship between species diversity and the functioning of ecosystems. ​Energy equivalence in forests? 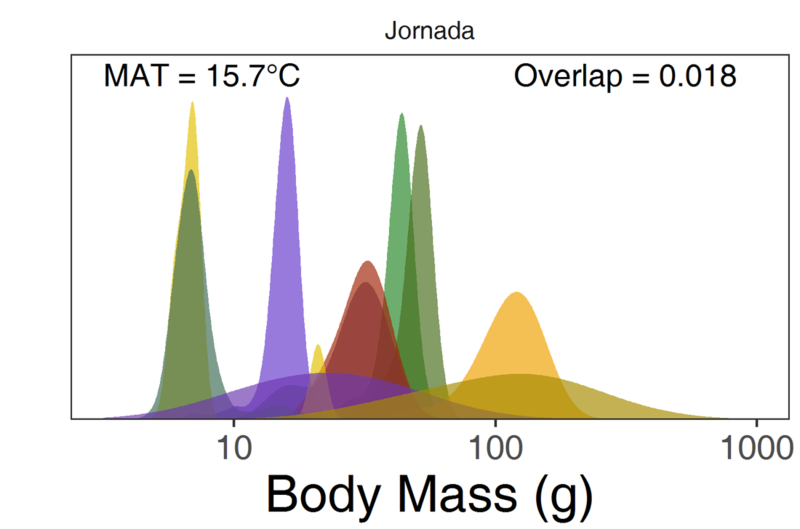 In a project led by fellow postdoc John Grady, we're asking how growth-mortality tradeoffs and light competition affect how energy is divided among trees of different sizes in temperate and tropical forests. Expect a publication in 2019. ​Forest biomass and tree lifespan over time. In collaboration with researchers at the University of Notre Dame, I am using a unique data source of forest surveys from the mid-1800s consisting of gridded measurements of forest composition, combined with tree functional trait information, to map changes in forest carbon cycling since European settlement in the Midwestern USA. This work is part of the PalEON network--read more here. ​The functional trait literature in ecology is replete with references to the "Holy Grail"--the elusive goal of predicting what species will be found in a given place, knowing only the traits of species present in the region and the environmental conditions at the location. I have worked to refine these models, but so far their predictive power seems to be lacking in some systems. Read more about this study here. My original approach to tackling big ecological questions (as a Ph.D. student at the University of Tennessee) involved making observations and conducting experiments in the field. Through these studies, I observed how natural systems respond to global change and how that response is determined by baseline environmental conditions and by the functional properties of local communities of organisms. We have a good understanding of how physical aspects of the environment affect living things, and how that relationship is changing due to human activities. However, we still don't understand how this relationship varies from place to place and how it is modified by interactions among organisms that differ in their traits. 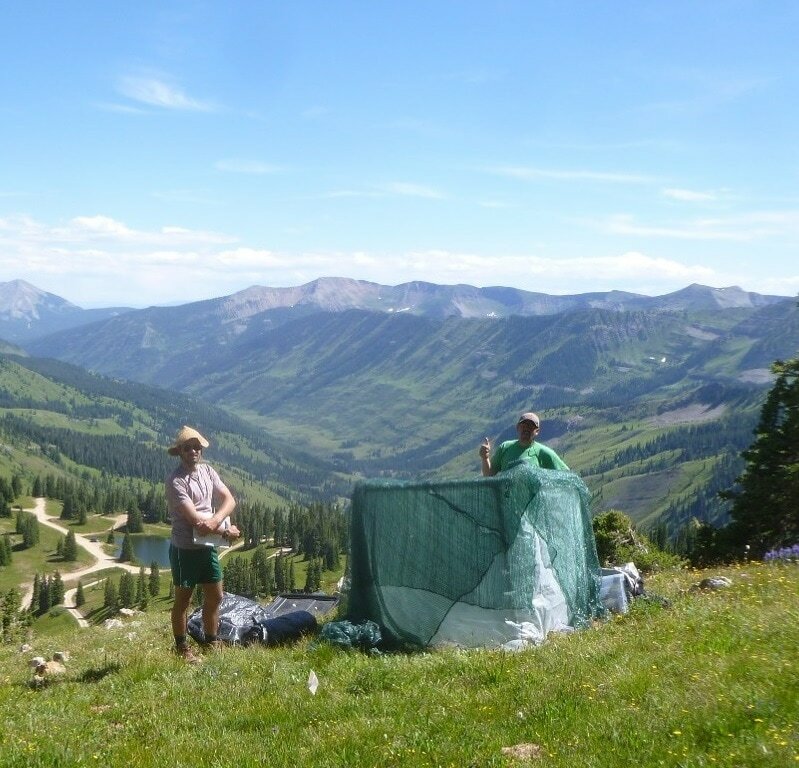 To address these questions, I developed and ran field studies in and around the Rocky Mountain Biological Laboratory in western Colorado. I simulated warming, nitrogen deposition, and loss of dominant species at study sites at different elevations. You can read more about the nitrogen deposition and species loss study here. I also explored trait variation within and among species in nature and in simulated data--read more about this work here and here. Preliminary results from the warming and species loss study conducted across elevations show that loss of dominant plant species has a bigger effect than warming on the remaining plant community, but only at low elevations where plants become dominant due to competitive traits.